There will be some changes to the Manchester United line-up this weekend. Luke Shaw and Ashley Young will both miss the game against West Ham with suspension, which means Marcos Rojo or Matteo Darmian could start at left-back. Ole Gunnar Solskjaer won’t want to make too many changes to his side though, and we expect the centre-back pairing of Chris Smalling and Victor Lindelof to remain the same, with Diogo Dalot at right-back. In midfield, Scott McTominay and Fred should keep their places after eye-catching displays against Barcelona. Ander Herrera has been ruled out and Nemanja Matic is unlikely to start in this one. That leaves the final midfield position to Paul Pogba, who had a good first half during the week before struggling to have any impact on the game after half-time. Although Alexis Sanchez is back training, we don’t expect him to feature against West Ham this weekend. Solskjaer hinted that the Chile international could make a return against his former club Barcelona at Camp Nou next week. Romelu Lukaku was awful during the week and will probably return to the bench this weekend. I expect Jesse Lingard to start on the right, Marcus Rashford to play in a more central role with Anthony Martial drifting in from the left. 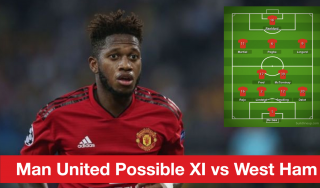 Predicted Man Utd line-up (4-3-3): De Gea; Dalot, Smalling, Lindelof, Rojo; Fred, McTominay, Pogba; Lingard, Rashford, Martial. Looking at the possible West Ham line-up, Declan Rice will be one to watch out for on Saturday. He has been tipped for a move to United this summer. Marko Arnautovic, Manuel Lanzini and Felipe Anderson all pose threats in behind former United striker Javier Hernandez. Our defence is bound to be tested at some point. Predicted West Ham line-up (4-2-3-1): Fabianski, Fredericks, Diop, Balbuena, Cresswell; Noble, Rice; Arnautovic, Lanzini, Anderson; Hernandez.